Ishita Marwah: “My aim is to create innovative solutions to tackle tuberculosis"
PhD student Ishita Marwah won a President’s Award for Excellence in Societal Engagement for communicating the immunology of latent tuberculosis. The President's Awards for Excellence in Societal Engagement are annual awards to recognise and reward staff, students and community partners who have connected Imperial and our research with society. Ishita won the Student Award for Societal Engagement in the 2017 President’s Awards for Excellence for helping the public to understand how exposure to the tuberculosis (TB) bacteria can lead to a dormant form of infection with no symptoms, called latent tuberculosis infection (LTBI). A quarter of the global population has LTBI, which has the potential to develop into the active TB disease. However, LTBI causes no symptoms since the person's immune system acts to ‘wall off’ the bacteria. Based in the Faculty of Medicine’s National Heart and Lung Institute , Ishita is now in the final year of her PhD. We spoke to Ishita about the work that led to her nomination, and her reflections on winning the President’s Award for Excellence. A health promotional animated video about latent TB testing and treatment options available in the UK. “We showcased the animation at Imperial Festival last year and received some really good feedback,” Ishita explains. “It was interesting to observe that children approached the film without prejudice, while adults came with more fixed assumptions about TB being a Victorian disease or limited to poorer countries, which is not necessarily true. London is in fact known as the TB capital of Europe,” adds Ishita. While the feedback was positive, Ishita identified that for the animation to truly reach and resonate with its target audiences, it would need to be translated into the most common languages spoken among communities eligible for LTBI testing and treatment. In order to achieve this, she secured funding worth £2,725 from the inaugural round of Imperial’s Societal Engagement Seed Fund . This was done by working collaboratively and harnessing the linguistic skillsets of local London communities which included asylum seekers and refugees in addition to academics and university students who all participated in translating and recording voiceovers. The Somali translation of the film was also screened to a Somali women’s group, Midaye, in west London. “This helped to break down barriers with this community and log crucial feedback,” Ishita says. All the translations were also reviewed by a multilingual focus group at the Imperial Invention Rooms in White City. Ishita’s film is now being displayed on Public Health England’s website and in GP clinic waiting rooms in London. On winning the Student Award for Excellence in Societal Engagement, Ishita said: “Though my public engagement work in itself is very rewarding, it was lovely to be recognised for this by the College. "As scientists, I feel that we’re often quite cocooned and lose sight of what our work will ultimately translate into. All of my interaction with the public over the last two years has reminded me to think about my research in this context. It has also helped me forge some enriching and hopefully lasting friendships, both within and outside of Imperial, and has brought the research team together in a way that work alone could not have." Ishita added: “Since winning the President’s Award, I have received a major confidence boost. It has also made me feel like I could explore public engagement in the future as a career option. 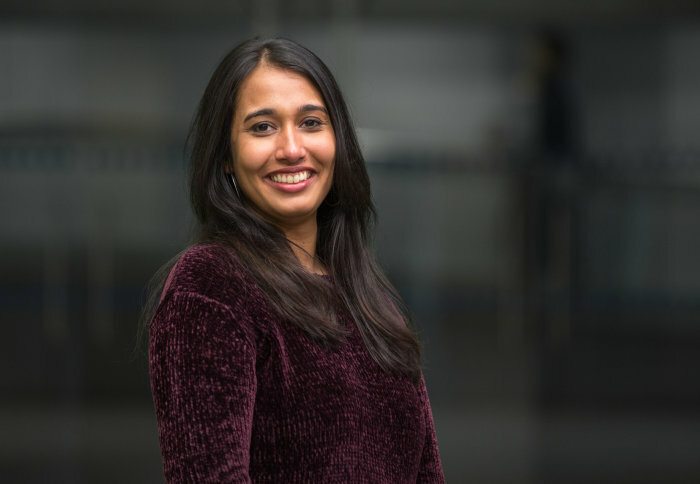 Ishita’s PhD investigates lung-based immune responses to TB by analysing which genes are switched on or off in people at the different states across the TB exposure spectrum. Her research will help in understanding how the body’s immune system fights TB infection, why some people who are exposed get infected whilst others remain uninfected, and why only some people who have LTBI develop the active TB disease. In turn, this will help to make new and more accurate tests to diagnose TB, and better vaccines to protect people from TB.